Smokey’s Den, originally at 127 N. Fifth St., was the first bar in Springfield that openly catered to gay men and women. When Smokey’s closed in 2003, after nearly four decades in business, it was thought to be the oldest gay bar in Illinois. Owner Mary Lou Schneider (1928-2015), a Jacksonville native, got the nickname “Smokey” during her career in amateur softball (she was inducted into the Illinois Amateur Softball Association Hall of Fame in 1973). Schneider, who was gay herself, opened Smokey’s Den in 1966 as both a business and a haven for members of the LGBT community. In a 2012 interview by the Vital Voice, a St. Louis publication, Schneider said Smokey’s had few problems with Springfield police, although patrons were initially careful. 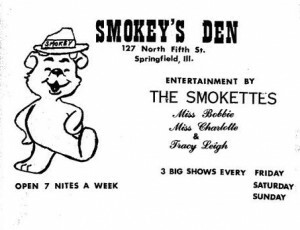 Smokey’s also hosted drag queen events – the Smokettes, the brainchild of Schneider’s cousin, was a popular touring act – and Schneider became the first promoter of the Miss Gay Illinois pageant. Schneider operated a second bar, Smokey’s Nu Den, on Peoria Road just outside city limits for several years starting in 1975. Annual $1,000 contributions from the “Friends of Smokey’s Den and Smokey’s Nu Den” were the largest single donations received by The State Journal-Register’s Friend-in-Deed Christmas charity from at least 1975 through 1978. The downtown tavern later moved to 411 E. Washington St.
Schneider, who died Jan. 1, 2015, is buried in Diamond Grove Cemetery in Jacksonville. More information: Martha Miller and Buff Carmichael wrote a remembrance of Schneider and Smokey’s in the Jan. 29, 2015 edition of Illinois Times, as did Jodi Woodard, who tended bar at Smokey’s for nine years, in the Jan. 31, 2015 State Journal-Register. This entry was posted in Amusements, Business, Hotels & taverns, Prominent figures, Social life. Bookmark the permalink.